Spigen is a big name case maker, big enough that it will almost certainly have got iPhone 6 information in advance in order to design cases for it. So when it lists both a 4.7-inch and 5.5-inch iPhone 6 case on Amazon we're inclined to think there's a good possibiility that it knows there'll be a 4.7 inch and 5.5 inch iPhone 6. That's not all the case maker has done though. 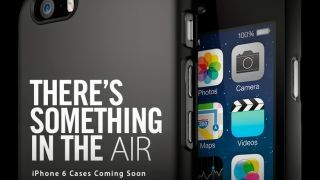 It's also posted an image on Google Plus of what appears to be an iPhone 6 (or more likely an iPhone 6 dummy or render) in a case, with the caption 'There's something in the Air' and the word 'Air' in a slimmer font for emphasis, while the 5.5 inch case is listed as the 'iPhone 6 Air Case' on Amazon. That's basically as good as saying that the 5.5 inch model will be called the iPhone Air or the iPhone 6 Air and it's not the first time we've come across that rumour either, as Chinese sources previously claimed that the 5.5 inch iPhone would go by that name. It's always possible that Spigen is just guessing the name and sizes of course, but it's one more bit of evidence for the birth of the iPhone Air. Speaking of Air, we're expecting a new iPad Air this year too.